The topic: the blog goes postal and takes advice from a dead man! The Blog: Your Excellency, may I bother you with one question? Frederick: So is Stephanie Meyer and J. K. Rowling. Look, I can't grasp what your generals are saying nowadays. The Blog: Maybe if I try to explain the latest military technologies to you ... Would that help? Frederick: I'm up to date with technology, I had 225 years of uninterrupted study. This is different, I am under the impression that the military thought of your days has an insatiable hunger for complexity. The Blog: War is complex, your Excellency. Frederick: I know, but it's the job of a general to make it simple for his soldiers. The Blog: What would be the simplest description of war? Frederick: A succession of violent acts to force peace on your enemies ... A peace that is favorable for you, off course! The Blog: A continuation of politics by other means, like Clausewitz said? Frederick: Clausewitz ... Pffft ... I said that one hundred twenty years before him! He could well be the one who started muddying the waters. The Blog: He is very respected, as much as you. Frederick: His writings are not practical. When bullets start flying, the battalion of philosophy is the first to flee the battlefield. The Blog: (out of ammunition) Allow me to present you with an opportunity to discuss practical matters of warfare. Frederick: You call your games "warfare"? The Blog: For what is worth, I am about to invade Saxony with your Armies, your Excellency ... And I plan to do it exactly as you did back in your time. Frederick: So you should be fine, as my plans were sound. The Blog: Yes. Yet I am a bit concerned that I will not win because your plans didn't include the occupation of these locations (pointing at a list of what the game calls strategic cities, AKA objectives). 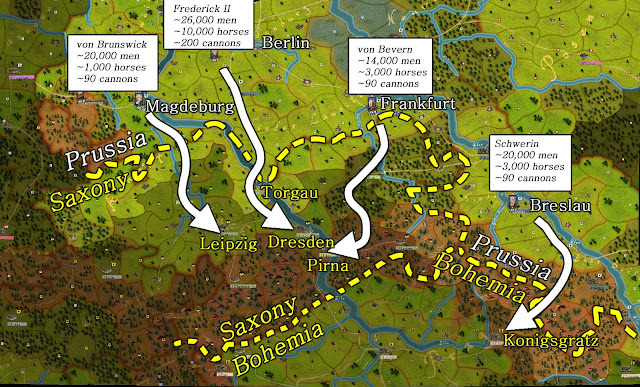 Frederick: The objective of my invasion of Saxony was to secure the Elbe River from Torgau to Pirna so I could wage a war against the Austrians and their allies. The Blog: With all due respect, your Excellency, you invaded the whole Saxony just for a river line? Frederick: Rivers provide a great supply route. The Elbe, the Oder are vital for the defense of Prussia ... Isn't the Elbe your main concern then? Frederick: The Saxon army is extremely weak. Your only worry is to force them into battle before the Austrians relieve them. The Blog: I need an objective that is not liquid ... What would be the ultimate land location to control in order to seriously threaten the Austrians and their allies? Frederick: The key to defeating the Austrians is Prague. But even I couldn't do it in the short period of time your game is giving you. You will have to settle for a good defensive stratagem based in the south border of Saxony. The Blog: I will explain my orders to the generals. I will let you know how it unfolds in 15 days ... I mean 10 minutes. We want more conversations like this. Freidrich couldn't do it. So why do you think you should? Soldier on!! It is very good, I agree that we need more of this to read.